Interest in apprenticeships soars as universities say fees will put too many students off. Universities joined the growing consensus against the rise in tuition fees today as figures revealed thousands are seeking alternative routes through apprenticeships. Higher education establishments across the country are vowing to drop their fees to below £7,500 after the Government announced incentives for those that charge lower amounts. The move comes after ministers announced that English institutions who charged £7,500 or lower would be able to bid for a share in 20,000 funded places. The decision has seen 12 universities, all of whom were planning to charge up to £9,000, express an interest in lowering their fees. The majority considering the move are believed to be former polytechnics, including the University of Derby and University of Hertfordshire. Despite the move, figures released yesterday suggested that the rise in fees will result in a drop of 7.5 per cent in the university enrollment rate for males and nearly 5 per cent for female students. Ministers, who had expected just a handful of elite institutions to charge £9,000, are desperate to drive fees down to reduce the burden of the student loan on the public purse. The move will also help reduce the mountain of crippling debt for some graduates. However, it drew widespread criticism yesterday and accusations that the Coalition’s policy is in complete disarray. It comes just one week before the admissions process for autumn 2012 is due to start. This means thousands will be expected to choose universities without knowing the cost. Liam Burns, president of the National Union of Students, said the revelation is yet another example of the Coalition’s shambolic policies. ‘With students preparing to submit university applications in just a matter of weeks, the shambles of the Government’s fees arrangements has left places being auctioned off to the lowest bidder and universities looking to cut corners,’ he said. ‘As a direct result of ministers’ bungled funding policies, prospective students have been left in the dark as to what universities will charge and now face an agonising wait for clarity over their future options. The disarray among the university fees comes as figures revealed that interest in apprenticeship vacancies has soared rapidly since the turn of the year. Statistics released by internet analysts Hitwise showed that since January 2011, searches for ‘apprenticeship vacancies’ have soared by 425 per cent, while the term ‘apprenticeship’ is up 62 per cent. 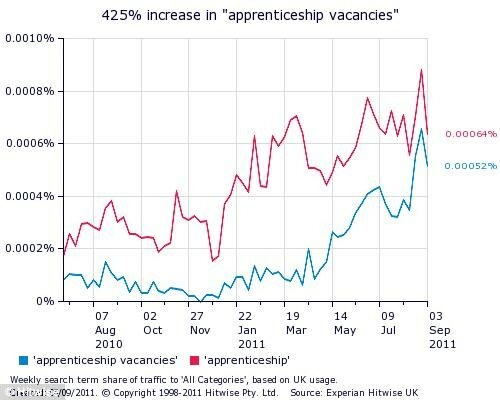 And the National Apprenticeship Service website has seen a 50 per cent rise in visits year on year. Another website, notgoingtouni.co.uk, has seen hits soar by 150 per cent since this time last year. The figures also revealed that the most popular type of apprenticeships searched for were that of plumber, engineer or electrician. And the most popular companies searched for included British Gas, NHS and British Telecom.